CRIMINAL MISCHIEF – On December 03, 2015 at 10:43am, Patrolman Justin Apel responded to a Chestnut Street address for a report of criminal mischief. The officer was met by a representative from the mortgage company who wish to report damage to a window that was done to the residence which was unoccupied at the time. THEFT – On December 05, 2015 at 1:27am, Patrolman Andrew Altman responded to a residence on the 300 block of Forepeak Avenue for a theft report. The victim reported that a PlayStation 4, Samsung tablet and PlayStation 3 were taken from the residence. The victim reported that several people were in and out of the residence during the time of the alleged theft which occurred between 9:30pm and 1:20am. Detective Adam Griesemer was assigned the case for follow up. CRIMINAL MISCHIEF – On December 05, 2015 at 9:36am, Patrolman Dennis Allen was dispatched to a residence on the 600 block of Bayside Avenue for a report of a mailbox being damaged. The resident reported that sometime during the overnight hours a male subject on a bicycle was seen on a home surveillance camera damaging the victims mailbox. Detectives are attempting to review the video footage to possibly identify the suspect. THEFT – On December 06, 2015 at 6:44pm, Officer Gina Bruno responded to a residence on the 200 block of Longboat Ave for a theft report. The victim reported that their son left his bicycle on the 900 block of Ship Avenue around 4:00pm and upon returning, discovered that someone had taken the bicycle. The bike was described as a red BMX type bicycle. 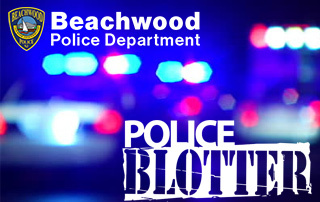 THEFT – On December 07, 2015 at 2:28pm, Patrolman Justin Apel was dispatched to Beachwood Bicycles at 101 Atlantic City Boulevard for a theft report. Upon the officers arrival, he learned that a subject stole a scooter from the store and fled. Store personnel chased the subject and were able to recover the scooter. The subject was located in South Toms River a short time later by South Toms River Police. The subject had an outstanding warrant from Toms River and he was also charged with the theft of the scooter which was valued at approximately $200.00. BURGLARY – On December 07, 2015 at 3:15pm, Patrolman Phil Schena was dispatched to a Chestnut Street address for a theft report. The victim advised the officer that sometime between 8:30am and 2:45pm on December 07, subject(s) broken into the residence through a basement window and stole a television, laptop and change. The residence was unoccupied at the time of the theft. Anyone with information is asked to contact Sergeant Daniel Altman at 732-286-6000 ext.184. CRIMINAL MISCHIEF – On December 08, 2015 at 3:11pm, Patrolman Phil Schena assisted Officer Randy Cabrerra at a residence on the 400 block of Berkeley Avenue where a window was reported broken. The officers were able to make contact with the previous property owner who advised that the bank now owns the property. Contact was made to repair the damaged property. THEFT – On December 08, 2015 at 5:41pm, Patrolman Keith Meissner was dispatched to a residence on the 200 block of Spar Avenue for a theft report. Upon the officers arrival, the victim reported that several pieces of jewelry were believed to have taken from the residence. The victim was unsure of the exact date the items went missing but has had several individuals in and out of the residence over a period of time. There was no forced entry to the residence. WARRANT ARREST – On December 09, 2015 at 3:34pm, Patrolman Phil Schena was dispatched to the area of the 600 block of Atlantic City Boulevard for a suspicious male subject. Upon the officer locating and speaking with the subject it was learned that the subject had an outstanding warrant for his arrest from Ocean County in the amount of $2500.00. As a result, Nelson Clark, 38 of Brick was arrested and turned over to the Ocean County Sheriff’s Department personnel. CRIMINAL MISCHIEF – On December 09, 2015 at 5:50pm, Patrolman Sean Langan responded to a residence on the 700 block of Longboat Avenue for criminal mischief to a vehicle. The victim advised the officer that sometime during the overnight hours someone threw eggs at the vehicle which was parked in the driveway. The victim reported minor damage to the vehicle from the egg throwing. DRUG ARREST – On December 11, 2015 at 12:54am, Patrolman Dennis Allen conducted a motor vehicle stop in the area of Atlantic City Boulevard and Starboard Street. As a result of the motor vehicle stop, Graham Dobbs, 19 of Toms River, was arrested and charged with possession of marijuana and issued several motor vehicle summonses. The subject was released pending a court date. CRIMINAL MISCHIEF – On December 14, 2015 at 10:19am, Patrolman Justin Apel responded to the park on Cherry Street and Windward Avenue where he was met by personnel from the Public Works Department. They reported that a bench was broken at the park.